As soon as it comes to the topic “processes” in companies if have experienced a big misunderstanding in all of the different sections of companies… and so far, I haven’t found a good explanation or description of this topic. Normally every company should define all types of processes which are relevant for the company, otherwise you will always have the misunderstanding of the word “process”. But then you also have the Business Processes. These employees have a lot of different skills or they are located within different sections or departments of the company… for example you will have employees which will build the cars out of different parts, then you have managers within you companies who will manage these employees. Normally the managers always have a the “big picture” of the company… so they know, what the company is all about… we are building cars, we deliver it to “resellers” and we earn money with this… so this is the main business process of this company… all other processes within this company support or enable this business process… so the above mentioned employee simply executes an operating process, which in the end enables the business process “building/ delivering cars”. 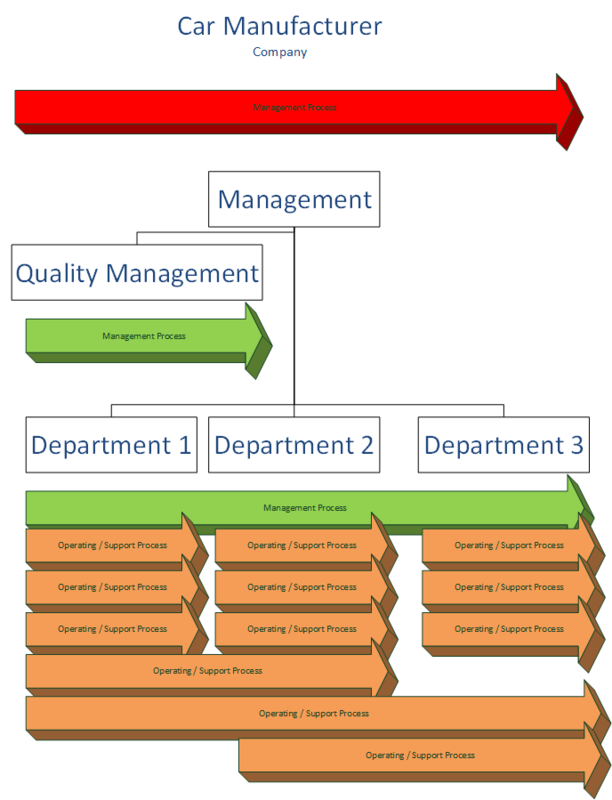 On the other hand, you have some employees, which will apply maintenance to the car manufacturing street within the company, so these employees will make sure, that the manufacturing tools of the others employees will work, so this is a typically support process… and last but not least, the companies have managers, which will execute some management processes… management processes will force the managers to for example measure the manufacturing process or measure the quality of each output. The picture below is an example for explaining processes in one company. You have the different Departments which are owner or user of specific Management processes or Operating or Support processes… in most case the processes are executed within different departments. The Main Business Process is the big red process on top of the company… In some companies it is not obvious to the employees, what the Business process ist, in this case you should explain this to you employees, if they don’t want to deal with is, then leave it, but at least “offer” the explanation of the “big picture”.